Who qualifies as a cohabitee? In modern society, cohabitation is an increasingly popular family structure. 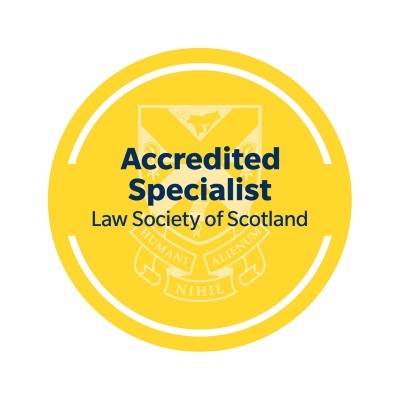 As one aspect of the response to this change, the Family Law (Scotland) Act 2006 was enacted to provide particular limited rights to cohabiting couples. 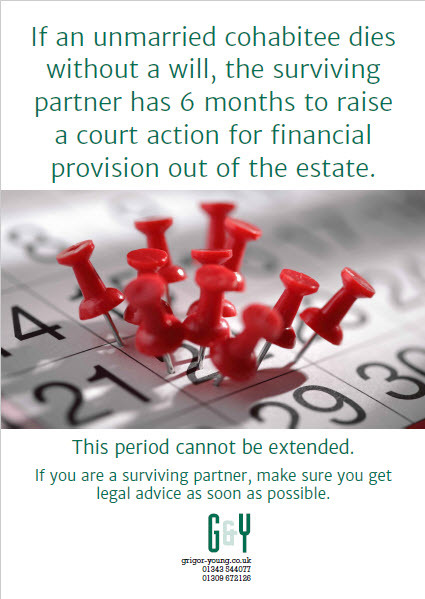 On the breakdown of their relationship within their lifetimes, a former cohabitee has the chance to make a claim for financial provision from his or her former partner. On the death of one of them – provided they did not leave a will – the survivor can make a claim for financial provision from the deceased’s estate. The time limit for a “separation” claim is one year from the date of separation and, for a “death” claim, only 6 months. These time limits are very short indeed and they cannot be extended. As a sort of public information drive, we have a poster we often display outside our offices which summarises the time limit for death claims. If a cohabitee dies as the result of an accident which is due to the fault or breach of duty of another person, there may be a claim for fatal accident compensation for the surviving cohabitee. In general terms, a “cohabitee” is defined as any person who is not the spouse of the other person but is “living with them as husband or wife” or “as civil partner”. This raises the question how wide is the definition of marriage or civil partnership? For example, do the two people concerned have to share the same address for it to fit the definition? In this article, we’re considering a case from 2016 in which the question whether a cohabitation was sufficiently “as husband and wife” was considered. In that case, it was not about death of a cohabitee but instead about provision of necessary services. These are generally nursing-type services provided by a relative to an injured person – e.g. help with washing, dressing, housework, shopping, driving and even just moral support. In D -v- Graham’s Dairies, the claim included an element for services provided by the female cohabitee of the injured man. They were in a relationship at the time of the accident and already had a daughter who was about 18 months old. They did not live together, however. This was because the lady had a 10-year-old daughter from a previous relationship and she had taken the child’s wishes into account. The long-term plan was that the two adults would eventually share a house but that had not happened yet. The judge considered a number of factors in deciding whether it was “living as husband and wife”. whether there were children of the relationship. Taking into account all these factors, the judge decided that the relationship was akin to marriage, so the services claim was valid and was granted (it was valued at over £7,500). 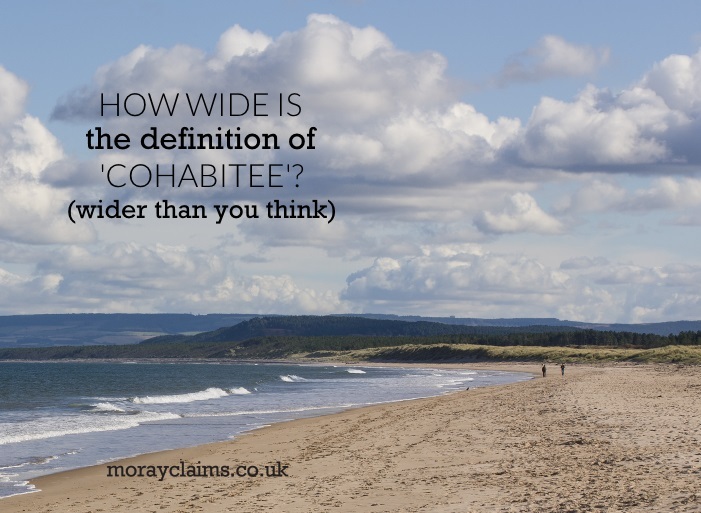 The definition of cohabitee is wider than you might think. If two people in a relationship with each other are not generally living under one roof together, you might think that would rule it out as a relationship akin to marriage or civil partnership – but that’s not the case. Each case will depend on its own facts. That emphasises the need not to assume anything if you are thrown into one of these terrible situations. 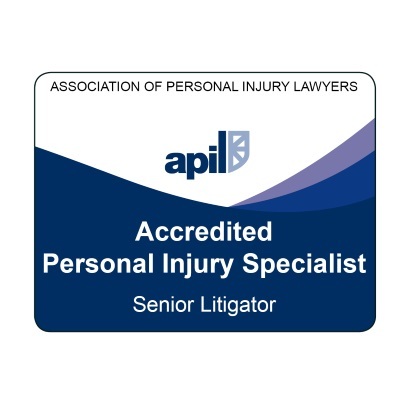 Get specialist legal advice as soon as possible so that evidence of all the indicators pointing to it being a relationship akin to marriage or civil partnership can be identified and vouched. The factors mentioned above from the Graham’s Dairies case are not exhaustive. Other factors could be relevant, depending on the circumstances. In one case we dealt with, the fact that the deceased had directed that certain benefits from his employers should go to his “cohabitee” in the event of his death was very important “additional factor” in a situation where two households operated, as in Graham’s Dairies. We hope you have found this article about the rights of cohabitants in fatal accident situations (and, in particular, who qualifies as a cohabitee) to be a help. If you have any questions at all, please contact us. 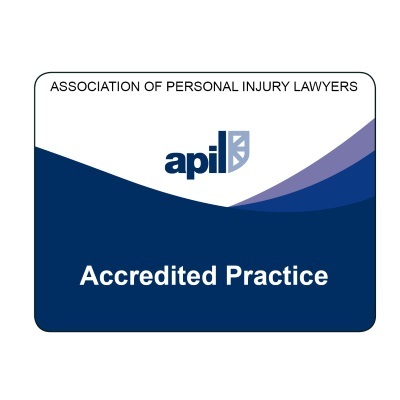 You can call either of our accredited specialist personal injury solicitors – Marie Morrison and Peter Brash – on 01343 544077 or send us a Free Online Enquiry. All initial enquiries are without obligation and free of charge.